After a long time apple reached strongest security on all apple devices through passcode and touch ID. So no one can do any kind of cheat by steal saved documents, Files in iCloud Drive and from apps also. But for the old fashioning people not want passcode on lock screen, yes you can remove passcode from iPhone 6, 6 Plus, 5S, 5, iPhone 6S, 6S Plus. Unlock passcode you need to remember digits but Touch ID you don’t. Simple touch your finger on home button to unlock screen or Download app from iTunes app store. For that you need to setup Touch ID for 5 finger but tricky way you can add more than 5 finger as a Touch ID. If you know for more security you can now setup 6 digit passcode in place of 4 digit passcode. Note: are you removing lock screen passcode due to wrong 6 digit setup? Then you can update that for 4 digit passcode. Step 1: Go to setting app on iPhone. Step 2: Next, scroll down then go with Touch ID & Passcode by tap on it. Step 3: Now, You can see option for Turn passcode off blue text. Else, you can update it through Change Passcode option. Once you Turn passcode off, All Touch ID automatically Disabled. 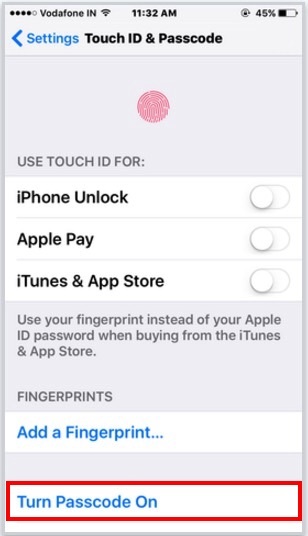 Further use you can set all old touch ID for next time whenever you turn on passcode. For Enable Passcode repeat above steps again and Choose Turn Passcode On. Which types of security you will lost if passcode disabled? Safari saved passwords, Saved credit cards data, Photos app, Message, Contacts and all other app and other important data. Don’t miss: set 4 digit passcode on dropbox. 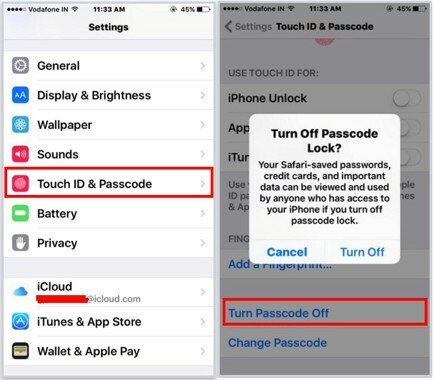 Any trouble on remove passcode from iPhone 6, iPhone 6 Plus? Then share with us on comment box also touch us on G+, Facebook or Twitter.